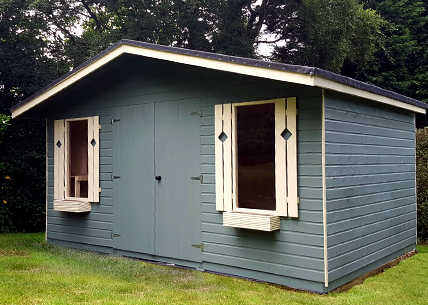 Our exquisite range of hand-crafted summerhouses come in a variety of distinctive styles, from modern chic to reassuringly traditional, so we have a design that will express your taste and be a perfect match for your garden. 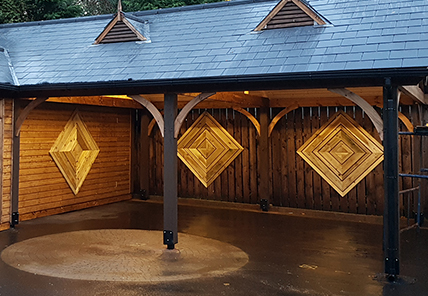 Drawing on two generations of experience, your summerhouse will be made with our expert skill and extraordinary attention to detail, then delivered and installed by our own team of joiners. It will bring years of joy and many happy summer memories to you and your family. 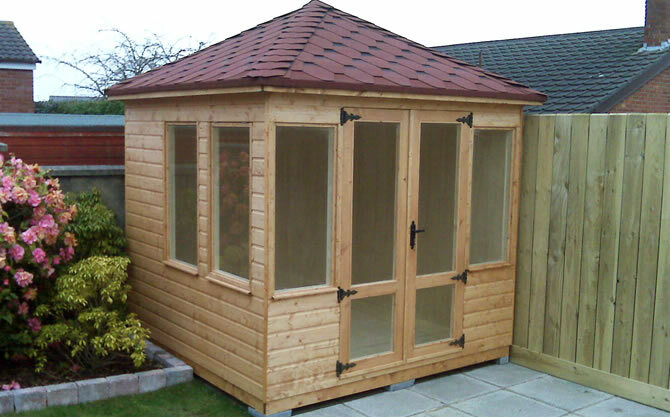 And why not make even more of your summerhouse? 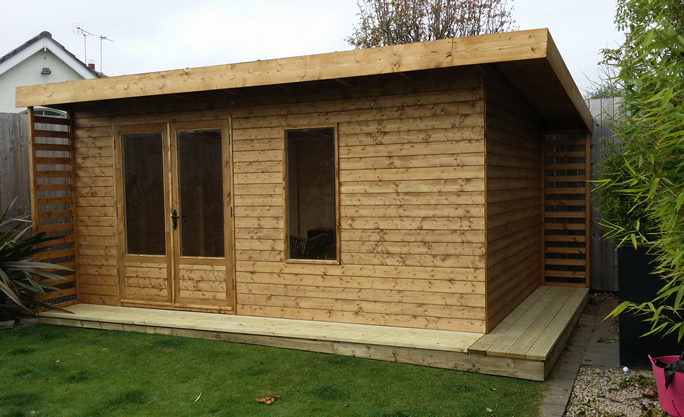 With options that include internal insulation and lining, and a full electrical pack, your summerhouse can easily become a year-round office or studio where you can relax, dine, work and play. 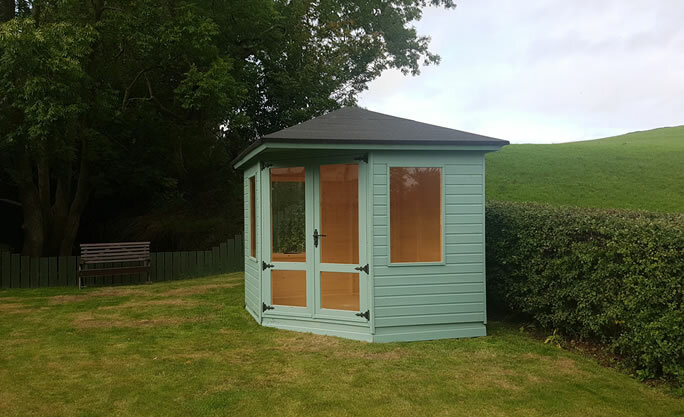 Sperrin by name, but with a clear Alpine influence, this classic chalet-style summerhouse features a shady overhanging apex roof, perfect to relax under on a hot summer day. 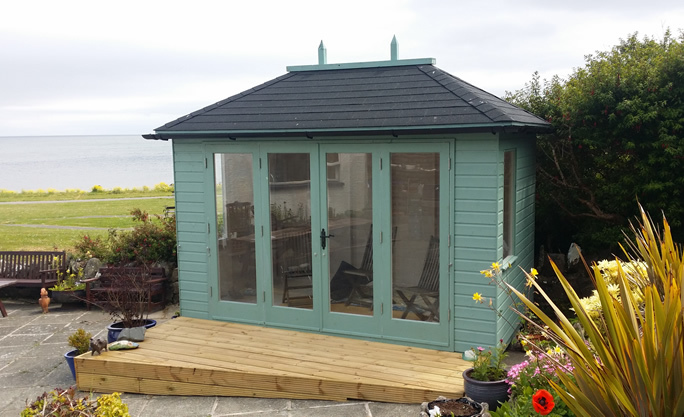 When designing this hexagonal summerhouse, our intention was to create a distinctive structure with an elegant facade and roof style. 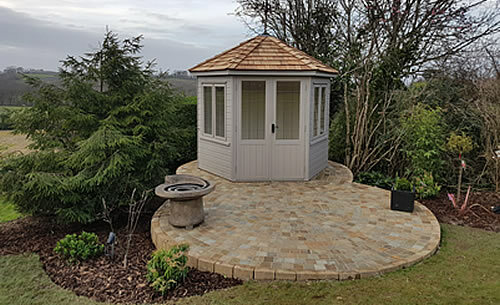 We believe the Wicklow fits the bill and it might very well fit your garden setting too, whether as a prominent centre piece, or a discrete retreat. 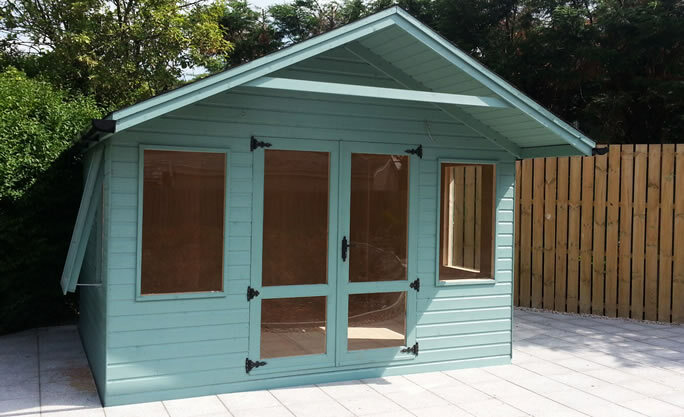 Perhaps there is a quiet corner of your garden into which the Binnian summerhouse might nestle? 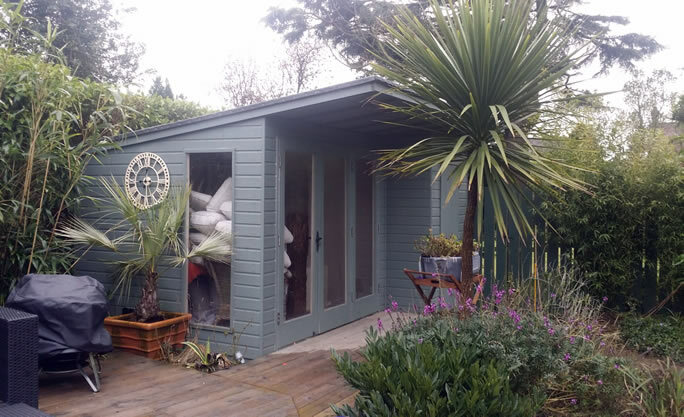 Created with corner nooks in mind, it is the perfect way to optimise space in your garden, no matter how compact it might be. The Bernagh is bound to delight. Classically rectangular, with an elegant hipped roof with bitumen shingles and flooded with light from full length portrait glass. 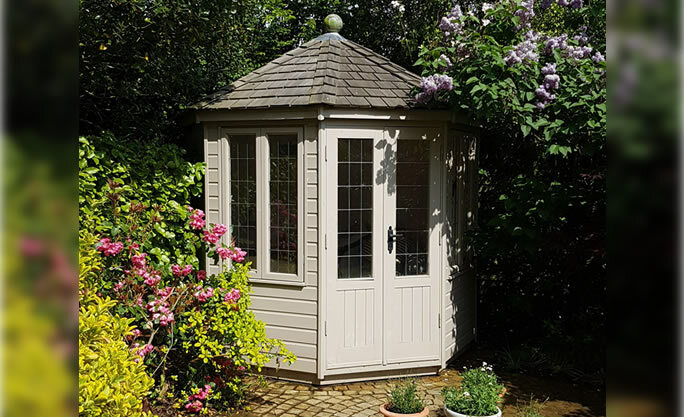 This octagonal summerhouse has an almost fairy-tale look to it, with stylish-looking details such as cross-leaded windows and a circular seating arrangement and capped by its eight-sided cedar shingle roof. 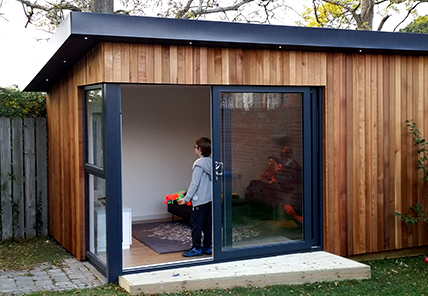 This model features a strikingly modern look, set off by its contemporary pent roof design, yet somehow it still sits comfortably in a more traditional garden setting. Pent roof. Straight lines. Crisp colours. Pared-back look. 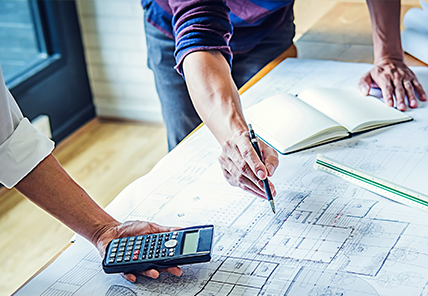 It all adds up to make one big, bold visual statement. So if mid-century, modern minimalist is your thing, you'll love the Ben Crom.